Recent years have seen several good additions to the Belgrade’s high-end hotel choice. We will guide you around the hotels in Belgrade which stand out for their style, quality of service, or location. If you travel in style, and price is no issue, Square Nine is most likely to please. If you prefer the buzz of being surrounded by statesmen and stars of show business, you will probably opt for Hyatt Regency or Metropol Palace. Business travellers wishing to make most of their time on the road and relax after a busy day may choose between Hotel In, Crown Plaza and Radisson Blu. New and ever better hostels are fast sprouting accross Belgrade offering plentiful and varied accommodation options. We have picked out the hotels with firmly established reputation for helpful staff and friendly atmosphere, as well as some completely new ones trying to make a difference with extra services. Attracting young party people looking to enjoy Belgrade’s fabled nightlife, hostels are not truly suitable for those who prefer peace and quiet during the night. All hostels below have rooms with A/C, internet access, a lounge and TV room, a well-equipped kitchen, and friendly staff that will happily assist you with insider tips on the city and club scene. Some hostels have private double rooms with en-suite bathroom. 360o. Located in the heart of the city, in the pedestrian area. Big terrace with a view. Bonus: Various activities and tours, free coffee, tea and internet. Metropol Palace, 5* Hotel which forged its reputation in the days of the former Yugoslavia, after having changed hands and undergone major refurbishments, is vying again for the top position in Belgrade’s hospitality industry catering to the most discerning and fastidious guests. Numerous amenities for business travellers. Suitably expensive. Belgrade Eye. One of the oldest established hostels in town, centrally located. Bonus: Summer garden, free internet. Chillton. One of the oldest established hostels in town. Bonus: In addition to the modern cooker, you may also use a wood burning cook stove. Airport pick-up:12€ (per car, book 1 day in advance). Square Nine, 5* Hotel of sophisticated design. Formidable central location, with the Belgrade fortress practically on its doorstep. The modern yet cosy décor features wood and leather, set off by fine antique furniture. Rooms are equipped with electronically controlled lights, curtains and blinds, and Nespresso machines. A personal butler is available upon request. Crossroads. Centrally located. Bonus: TV set in private rooms. 2 Rooms (1 double, 1 triple). An elegant restaurant with organic gourmet products is part of the hotel. Very chic! Hedonist. Centrally located, in a ground-floor house with a garden. Bonus: summer garden (video projector & BBQ), Rent-a-Bicycle, free Wi-Fi. Hostelche. Centrally located. Bonus: Rent-a-Bicycle. Free coffee, tea and Wi-Fi. Indigo. Centrally located. Big terrace with a view. Bonus: Free coffee, tea and Wi-Fi. Townhouse 27, 4* According to the guest reviews, this is currently one of the best hotel in Belgrade. This brand new hotel is centrally located, in close proximity to the pedestrian zone. The rooms are spacious, featuring modern minimalist furniture, each fitted with espresso machine, Bang & Olufsen A/V equipment and Wi-Fi. Some rooms come with a Jacuzzi bath. Manga. Centrally located. Bonus: Play-station 3 and plenty of games. Borrow for free guidebooks to Belgrade & Serbia. Skadarlija Sunrise. Located in Skada-rlija, a landmark Belgrade street. Separate WC and bathrooms. Bonus: Free coffee, tea and Wi-Fi. Falkensteiner, 4*s One of the latest addition to Belgrade’s high-end hotel market, offering excellent conference venues and thus best suited to business traveller. It is located in the commercial part of New Belgrade, near the Danube shore lined with floating restaurants and clubs, including the Grand Casino. They are partners of the Miles & More program. Radisson Blu Old Mill, 4* New and modern high-end hotel located in an adapted old mill, near the motorway and the Belgrade Fair. If industrial design suits your taste, you will love the stylish cosy sound-proof rooms with wooden flooring and hand-painted walls. A: Bulevar Vojvode Mišića 15, Tel: +38111 2250-000. www.radissonblu.com. Courtyard Marriott, 4* Recently opened hotel located in the very heart of the city, right next to the National Theatre. Suitable for both business travellers and sightseeing tourists, the hotel offers a standard range of services associated with this international chain. Comfortable beds and good service. A little on the expensive side as compared to most 4* hotels. Basco Agency. 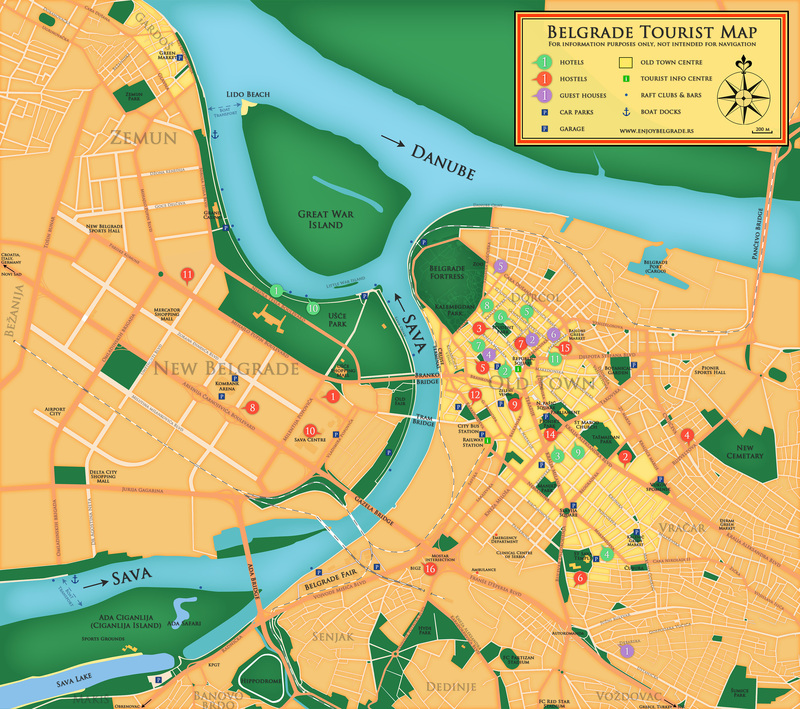 Rental of apartments in the city centre and New Belgrade. The apartments are well appointed, with modern furniture and A/C, sleeping 2-4. The rates are lower than those charged in hotels for similar accommodation. This is a good option for families of four who wish to cut down on hotel costs and do not mind cooking their own food. A: Nušićeva 18 (Office, Open: Mon-Fri. 9-17, Sat. 9-15), Tel: +381 11 2187-406, +381 64 6476-996 (24h Reservations&Check-in), www.bascoagency.com. Upside: central location, cheaper than hotels. Downside: no round the clock service. In, 4* A new and modern hotel in the heart of the commercial centre of New Belgrade, situated right next to the Belgrade Arena, just off the motorway, ideally suited for a business traveller. The interior design applies modern materials such as sleek metal and glass, creating a cool minimalist feel. A: Arsenija Čarnojevića 56, Tel: +381 11 3105-300, www.inhotel-belgrade.rs. Moskva, 4* An elegant hotel in the very heart of the city, Moskva is one of Belgrade’s landmark hotels. Opened in 1907, it has played host to many celebrities (Einstein, De Niro, Sartre…). It was completely renovated over the last year. Standard or duplex room. The hotel patisserie is one of the best in town, try the Moskva Šnit cake invented here. Zira, 4* New and modern hotel set in a slightly down-at-heel area, some ten- minute drive away from the city centre. Attentive staff, good restaurant and free international telephone calls make up somewhat for the unattractive room view. A small shopping mall and a supermarket are conveniently housed within the same complex. Non smoking hotel. Rezime Crown. Spacious rooms - bedroom + living room, with high ceilings and traditional stylish furniture, stretching over the first two floors of a handsome building in the heart of the pedestrian area. Those attentive to details may feel that electric cords draped over the largely unadorned walls painted in tranquil pastel colours somewhat spoil the effect. Crystal, 4*A small elegant and comfortable hotel nestled in a quiet street near St Sava Temple. Suitable for tourists, couples and business travellers alike. own food. Additionally, the agency offers airport transfer and translation services. Apartments are in different locations and vary in quality and you should always check the details before committing. A: Dečanska 7, Tel: +381 11 3227-925, crystalcode.co.rs. Facilities: cable TV, washing machine, Wi-Fi. Upside: central location, cheaper than hotels. Downside: street noise, no round the clock service. Excelsior, 3* Opened in 1924, it has re- cently undergone thorough renovation of all rooms following the change of the owner. The rooms are clean and well-appointed. Those overlooking the park and the Parliament have a superb view, and those facing the side street offer a quiet night's sleep without noise from the street. Le Petit Piaf, 3* A charming hotel nestled in the heart of the colourful bohemian quarter in the city centre, known for restaurants with traditional dishes and live music. Bright and clean rooms are well-equipped with modern comforts, although on the small side. Ideal for tourists who choose location over luxury.